The altimetry mission SWOT will provide Sea Surface Height (SSH) data-sets at unprecedented resolution (10-100km) with a 2D coverage in space. Such a data-set requires development of new diagnostic tools to unveil different dynamical aspects of the mesoscales (horizontal scales around 300km) and submesoscales (around 30km) that can be extracted from the SSH signal. Indeed, meso and submesoscales capture a large part of the vertical heat fluxes and they both play an essential role for the large-scale circulation and for physical-biogeochemical interactions. One of the main goals of the mission is to diagnose and potentially quantify these vertical fluxes. Two different issues emerge in dealing with the submesoscale SSH signal. First, it is not clear what dynamical regimes (internal tides, ageostrophic or balanced dynamics) dominate the SSH signal below 50km. Determining where and when each regime dominates will provide a better understanding of the SSH variance spectral slopes that are observed to spatially vary in oceanic basins. It would also help determining whether the SSH variance spectral slopes are consistent with other information provided with other tools (Sea Surface temperature spectra, Lyapunov exponents, relative dispersion...). A second issue concerns the instrumental noise of the SWOT SSH signal at submesoscales and its impact on estimations of the circulation based on advanced dynamical tools. An Eulerian characterization of submesoscales could be to calculate relative vorticity, which is necessary in order to compute vertical velocities. However, this implies to take the second derivative of SSH which greatly increases the noise relatively to the signal, so that meso and submesoscales become challenging to measure. Henceforth, one needs new tools to reconstruct the submesoscales through methods relying on Geophysical Fluid Dynamics theories and/or on synergies between different satellite sensors (SST, SSH, SSS). Such techniques will help to reconstruct both surface submesoscales and 3D motions at depth. Our proposal intends to address such questions and we expect to provide new ways of interpreting dynamically the SWOT SSH signal. By the past, significant advances in the theory of submesoscales dynamics have been obtained (see Review of Klein and Lapeyre 2009 for instance) and have allowed a better interpretation of the physics behind the interaction of submesoscales with mesoscale motions and internal waves. We build upon the strong experience of our team in this topic to go one step further. The tools that will be developed will be tested in the preparatory part of SWOT mission by combining numerical simulations of the oceanic circulation reproducing the mesoscale/submesoscale turbulence along with new processes (e.g. internal tides) with SWOT simulator estimates of the actual SWOT SSH data. The final purpose is to have these tools ready prior to the launch of the mission. A first question that we intend to address is what types of dynamics affect the SSH signal. This question arises when one needs examining the SSH signal at scales below 100km. Indeed, different studies pointed out that scales around 50km can be affected by internal tides, mixed-layer instabilities, potential vorticity or SQG dynamics. We can think that this depends on the spatial region considered, or the time of the year, which impacts the energetic content of the mesoscales. What are the relations between the SSH and other tracers (SST, salinity, chlorophyll)? To this end, we will examine the geometrical characteristics of these tracers, in terms of spectral slopes, gradients, etc. This will be done through the analysis of different satellite datasets (METOP, etc.). Such an analysis will provide some information about the energy content of scales around 30km. How to relate the SSH signal to standard dynamical regimes (i.e. QG vs SQG vs ageostrophic)? This can be done by using other diagnostics, such as relative dispersion of drifters, but we need to understand how different dynamical regimes affect the statistical properties of the dispersion. How can we separate the balanced (slowly evolving) dynamics from the unbalanced ones (such as internal tides)? We propose here to take on this challenge by developing innovative methods rooted in fundamental GFD concepts and testing these methods with both idealized and realistic simulations of the ocean circulation combined with realistic error estimates from the SWOT simulator. We also propose to improve our understanding of internal tides (i.e. tidal internal waves) predictability. The second question addresses the reconstruction of geostrophic currents and vertical velocities, in time (between 2 passes of the satellite, i.e. 10 days) and in space (at depth). This can be done through the development of new theoretical methods. 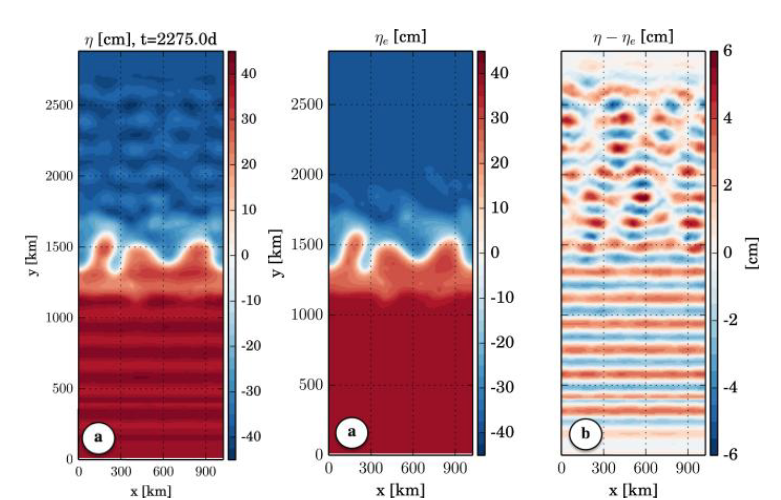 One way to overcome to the noise instrument issue that increases as the wavelength decreases and therefore that hinders the characterization of submesocale features from SWOT data, is to use a synergy between SSH and SST, or other tracers, to reconstruct small scales starting from data at 50 km or more. An interesting method to do this is based upon Lagrangian advection of tracer fields by velocities computed from SSH. Using mesoscale velocities derived from SWOT signal could considerably improve the reconstruction of submesoscales. The different members of our team have gained a strong international expertise on this topic (see Desprès et al., 2011, Dencausse et al., 2014, Berti and Lapeyre 2014). The coupling of the Lagrangian method with SQG dynamics will also allow to access three-dimensional submesoscale features of upper-ocean flows, which can be quantified by the vorticity field on the horizontal and by the divergence field on the vertical. Another component concerns the reconstruction of SSH in the observation gaps between the SWOT 2D swaths, using a form of dynamical interpolation. Ubelmann et al. (2014) have shown how a simple shallow-water model can be used to interpolate dynamically through the temporal gaps of approximately 10 days between the SWOT swath observations. The shallow-water model has a strong dynamical basis with a conservation of potential vorticity, and is based only on SSH variations. This technique does not rely on any pre-defined statistical structures, as with an optimal interpolation (OI). We intend to work on applying this technique to high resolution along-track altimeter data, using SAR or Ka-band techniques with lower noise, as well as testing the technique with simulated SWOT data. One key point to address is how the error budget will be projected into the observation gaps, taking into account the altimetry measurement error and the sampling error in a dynamic framework. A last aspect is to reconstruct submesoscale signal using new in situ datasets of high resolution. We intend to use sensors (SST, SSS) present on ocean seals that are able to swim across oceanic fronts and dive up to 2000m. With the help of SSH and these high-resolution data-sets, we expect to obtain vertical velocities at fine scales. One can first evoke that a review of Surface Quasi-Geostrophy (SQG) has been published in 2017 (Lapeyre 2017) which extensively described all known results about that subject. These concern mathematical properties of SQG equations, coherent structures, related instabilities, characteristics of the SQG turbulence. It also discussed how these ideas can be applied to the ocean or atmosphere dynamics. Within the quasi-geostrophic approximation, oceanic turbulence at meso and submesoscale can be described in terms of dynamical regimes which depend on the relative energy of submesoscales compared to mesoscales. Relative dispersion statistics in idealized simulations of QG/SQG (such as α- models) or QG-Mixed Layer turbulence will be examined. We intend to clarify how the energy of submesoscales affects the fixed-time and fixed-scale statistics, such as Lyapunov exponents, or dispersion p.d.f.s in order to quantify the energetic content of submesoscales (see Figure 1 for 1st results). Figure 1. Lyapunov exponent λ as a function of spatial scale δ, which determines the dispersion rate of particles at a fixed scale of separation. For nonlocal dynamics (simulations with α close to 2), the exponent is almost independent of the scale δ while for local dynamics (α close to 1) it decreases rapidly with δ.. From Foussard et al. (2017). Moreover, a configuration of a numerical model including semi-diurnal internal tides in the presence of a mesoscale eddy field will be developed to investigate how tides and mesoscales are depending on the intensity of the mesoscales. An original method that combines SSH maps (such as measured by SWOT) and surface density (such as measured through SST) will be developed to separate the signatures of internal tides from meso and submesoscales (1st results in Ponte et al. 2017, see Figure 2). Figure 2. Left: SSH from a simulation resolving an Eastward baroclinic current in presence of internal tides. Middle and right panels: decomposition using a dynamical method (based on potential vorticity) in a balanced signal and a wave-like signal (from Ponte et al. (2017)). Concerning satellite analysis, we intend to study the seasonal variability of the SST/SSH correlation and of SST spectral slopes (see Figure 3 for 1st results) and correlate it with different indicators (e.g. mixed layer depth, wind forcing). We will also examine the geometric description of SST fronts in relation to SSH from present satellite missions (AVHRR, MODIS, Altika, etc. ), using wavelets, gradients, etc. Figure 3. Left: spatial correlation between SST and SSH at mesoscales from satellite data. Right: Spectral slope of the SST variance (in k–n). High correlations mean that SSH signal is balanced, almost QG at mesoscales. (E. Autret and B. Chapron, in preparation). We will use the new method of dynamical interpolation in time, developed by Ubelmann et al (2014), and apply it to the Western Mediterranean Sea to see how it behaves in a region of moderate to low eddy energy in the presence of bathymetry and islands. This method was proved to be useful to obtain 2D gridded SSH fields between two altimeter passes but only for situations far from the coast. The dynamical interpolation shows a net improvement over linear interpolation (Figure 4) for idealized studies using high-resolution models to simulate the data. The next steps will look at using realistic alongtrack data and SWOT simulated data and errors in this analysis. The western Mediterranean Sea has low tides, but some internal tides, and their impact on the dynamical interpolation needs to be addressed. Figure 4. Patterns in the skill improvement of dynamical interpolation compared to linear interpolation within a 10-day observation gaps in the western Mediterranean Sea, for (a) Winter, (b), Spring averaged over five years 2007-2011. No units. Red indicates improvement from dynamical interpolation (from Rogé et al. (2017)). Using realistic simulations from the JAMSTEC or the JPL, we intend to analyse the respective contribution of balanced and unbalanced motions, depending on the location, the season or the spatial resolution. This will give precious information to determine in which location we expect that reconstruction methods may work. We will develop new methods to reconstruct an improved submesoscale field (including 3d velocities) from low-resolution data using Lagrangian and SQG techniques. Tests will be performed in idealized and realistic simulations. Other methods will be developed using different datasets (from Southern Elephant Seals that provide high resolution data when crossing fronts of the Antarctic Circumpolar Current). G. Lapeyre, 2017. Surface Quasi-Geostrophy. Fluids, 2, 7. A. Foussard, S. Berti, X. Perrot and G. Lapeyre, 2017. Relative dispersion in generalized two-dimensional turbulence. Journal of Fluid Mechanics. 821, 358—383. A. L. Ponte, P. Klein, M. Dunphy, and S. L. Gentil (2017). Low-mode internal tides and balanced dynamics disentanglement in altimetric observations: Synergy with surface density observations. J. Geophys. Res., Oceans. 122, doi 10.1002/2016JC012214. P. Klein and G. Lapeyre, 2009. The oceanic vertical pump induced by mesoscale eddies. Annual Review of Marine Science, 1, 351-375. A. Desprès, G. Reverdin and F. D'Ovidio, 2011. Mechanisms and spatial variability of meso scale frontogenesis in the northwestern subpolar gyre. Ocean Modelling. 37, 99-113. G. Dencausse, R. Morrow and M. Rogé and S. Fleur, 2014. Lateral stirring of large-scale tracer fields by altimetry. Ocean Dynamics 64, 61-78. S. Berti and G. Lapeyre 2014. 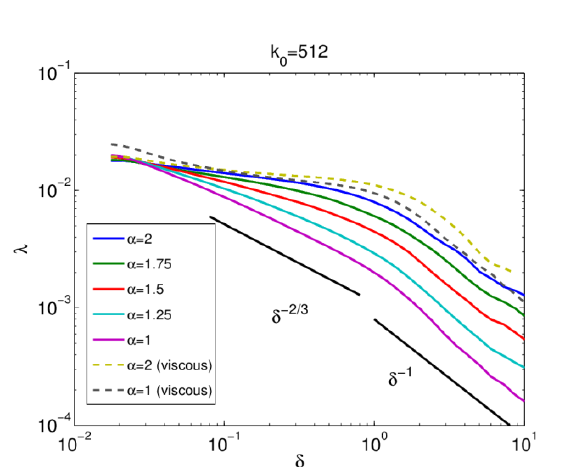 Lagrangian reconstructions of temperature and velocity in a model of surface ocean turbulence. Ocean Modelling, 76, 59-71. C. Ubelmann, P. Klein and L. Fu, 2014. Dynamic Interpolation of Sea Surface Height and Potential Applications for Future High-Resolution Altimetry Mapping. Journal of Atmospheric and Oceanic Technology. 32, 177-184. M. Rogé, Morrow R, Ubelmann C and Dibarboure G (2016). Using a dynamical advection to reconstruct a part of the SSH evolution in the context of SWOT, application to the Mediterranean Sea. Ocean Dynamics (in press).